The two trees pictured on the right are tropical guavas. The closer one is a pink and the further one is a white, most likely a Turnbull. They were planted approximately two years before this picture was taken and have tripled in size since planting. Both plants started producing a small amount of fruit immediately but didn't become really productive until they reached a year old. The taste of the fruit improved over time as well. Being located in the North East corner of the yard they receive a fair amount of afternoon sun before being shaded by the house after five in the evening. Being close to the walls also helps to protect them from freezing in the winter. Tropical guavas are one of the easiest to grow of all the tropical fruits. Once established, they do very well in the summer heat. There are hundreds if not thousands of varieties of tropical guavas. Most often people just refer to tropical guavas by the internal color of their fruit, although some select cultivars have been isolated. It is important to distinguish between tropical guavas, cattley guavas, and pineapple guavas (feijoas). 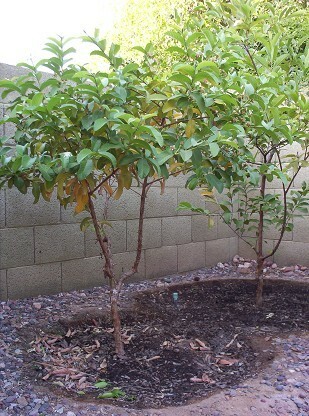 Cattley guavas do not do very well in Phoenix because they struggle in our hot summers and alkaline soil. With a lot of effort a cattley guava can be kept alive but will still most likely end up producing sour fruit. Cattley guavas can be distinguished from tropical guavas because they have smaller thicker shinier leaves and small fruit. They come in two cultivars named Strawberry Guavas and Lemon Guavas. Cattleys are more hardy than tropical guavas so they might actually be a good fit for elevations of 2000 to 4000 feet in Arizona where summers are cooler but winters are not ever colder than 20 degrees. Southern California is an almost ideal climate for them. More information on cattley guavas can be found on Julia Morton's site. Feijoas (Pineapple Guavas) grow fairly well in the lower desert but can take years to fruit especially if they are seedlings. They do best on a grass watering schedule with afternoon shade. To minimize the time it takes them to fruit, buy two grafted varieties that will cross pollinate and also cross pollinate them by hand. Never fertilize pineapple guava trees in our soil, because they burn very easily and grow well without any fertilizer. I have included a posting in the forum showing my pineapple guava flowers and pineapple guava fruit. More information on feijoas can be found at Julia Morton's site and on the CRFG site. Tropical guava varieties are available as seedlings, grafts, and rarely as air layers. Many seedlings are close to if not the same quality as their parents, and have the advantage of always recovering from a freeze true to type, even if frozen all the way to the ground. Grafted guavas are especially high quality varieties, but the graft can potentially be lost with an especially hard freeze. Air layers are genetically identical to their parents and will also recover true to type from a hard freeze, so they are best of all. in the spring and fall. The flowers are white with many stamens and have a mildly sweet scent. The spring flowers become ripe in late summer while the fall flowers become ripe in late spring. All guavas have an unusual aromatic floral flavor not found in other fruits. Below I have detailed the characteristics of the guavas I currently have growing in my yard. S.E. Asian White guava fruit, shown above hanging on the tree and below on the right, are crunchy and round, and pear like in texture and even in flavor. The seeds are generally hard in this variety and just barely chewable, but I generally eat around the seed core. My white guava tree was named "Bangkok Apple" by the seller I bought it from, and was grown from seed. It is most likely a variety known as "Turnbull". The skin of its fruit and its leaves have a cinnamon quality to them. There is another variety of white guava which is soft, pear shaped, with chewable seeds, and more similar to the tropic pink variety, because it has more of the guava aroma to it. I am working on getting one of these trees as well, because it is definitely delicious in its own way. My white guava tree froze all the way to the ground on a phenomenally cold night in January of 2007. It has since recovered from its roots and produced fruit equal to its fruit before it was frozen. On the same night, my pink tropical guava only froze about half way to the ground, leaving me to believe that white guavas are more cold sensitive than pink. so about half of the crop is of peak quality in the fall and the majority of the crop is at peak quality in the spring. It is difficult to tell when a white guava is ripe by color. 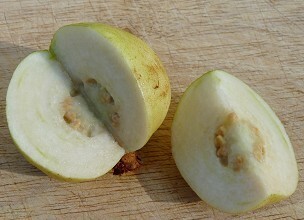 When close to ripe it starts to get some yellow on its skin but it can be in this state for quite some time before it is actually ready to eat. The best way to tell if a white guava is ripe is to smell the flower end. If it smells sweet then the guava is ready. Sometimes the flower end of the guava will also get soft, but if one waits for this indicator then it is more likely the guava will be overripe. Pink guava fruit are softer than S.E. Asian white, have chewable seeds, and turn a bright yellow when they are ripe. They have a stronger smell and flavor which makes them great for juice and jam. My pink guava tree was named "Tropical Pink" by the seller I bought it from, and was grown from seed. My pink guava tree froze half way to the ground on a phenomenally cold night in January of 2007. It has since recovered and produced fruit equal to its fruit before it was frozen. On the same night, my white tropical guava tree froze all the way to the ground, leaving me to believe that pink guavas are more hardy than the white. temperatures are below 100 F., so about half of the crop is of peak quality in the fall and the majority of the crop is at peak quality in the spring. When temperatures are high the fruit flavor is very strong and musky and not very sweet but it is still very good for juice and smoothies. 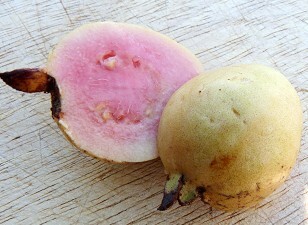 When ripe a pink guava will fall off the tree. However, it is better to pick them right before they get to the falling point so that they are not overripe. To check if they are ready, cradle them in your palm and tap them with your fingers. If they fall off in your hand, then they are perfect. Mexican Cream is a grafted variety tropical guava I am growing. It is a yellow guava with a yellow interior. It is very delicious regardless of high summer temperatures, so I currently rank it as my favorite. Like the other tropical guavas listed on this page it fruits in the spring and fall. When ripe, the fruits become very loosely held on the tree and often fall off similar to the pink guava. If you want to know what a Mexican Cream tastes like, it is the variety of guava used in Jumex canned guava juice. I planted this tree after the freeze of 2007 so I have yet to see how it handles freezing temperatures. Since it is a graft, I cover it on the coldest winter nights. Tropical guavas do very well in the summer in Phoenix. In fact, the higher the temperature gets the more rapidly they grow. However, newly planted guavas should be protected from afternoon sun their first summer. Guavas are hardy down to 29 degrees Fahrenheit so it is best to plant them close to houses, walls or other objects that store heat at night. When planted in a good microclimate within the city, there is little reason to be concerned about a guava during the winter. People living near the outskirts of town might want to cover their plants during unusually cold winter nights. Fortunately, if frozen to the ground guavas will usually re-emerge from their roots the next spring. In cool weather, guavas will develop a purple discoloration on their leaves. This is not frost damage and happens every winter without damaging the plant. Guavas do well on a grass watering schedule. 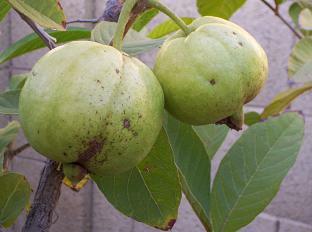 Guavas grow rapidly and are therefore heavy feeders. During the growing season, approximately April to October, a guava can be fertilized every 2 to 4 weeks using a high nitrogen fertilizer. They should not be fertilized during the cool time of the year when they are growing slowly. I have found the fertilizers with a 5 to 1 nitrogen to phosphorus and potassium ratio work best, such as fish emulsion 5-1-1, and Miracle Grow 36-6-6. Bloom booster type fertilizers with high phosphorus and potassium ratio do not appear to promote blooming as one would hope, and instead seem to burn guavas. Guavas are somewhat true from seed, meaning that the plant from a seed will be similar to its parent. Still, the best varieties of guava are grafts, air layers, or root cuttings. Air layers and root cuttings are more desirable for the Phoenix area than grafts because the home grower will have no worries about the plant freezing down to the graft level. S.E. Asian White guavas have a problem with little flying beetles in the fall. These beetles will start eating the flower end of the guava right before it gets ripe. Sometimes the ruined section of guava can be cut away and the rest is salvageable. Fortunately, the spring crop of guavas is not bothered by them.